If this year's stratosphere watch will be half as interesting as 2017-18's was, then we'd be doing very well. To start off, let's have a look at what's going on currently in the stratosphere. This is the time of year when the Polar Vortex really begins to reorganise itself and the stratosphere cools down along with it. Recently, the stratosphere has gone even cooler than average, quite substantially so as shown by the JMA stratosphere analysis below of both 10hPa and 30hPa in the stratosphere. These cooler than average stratospheric temperatures usually equate to an intensified jet stream. Why we have not seen this and even had a cold snap caused by a northerly wind is because the stratosphere and troposphere have been off with each other, they've been disconnected. A recent example of this was in late Autumn 2016 when we had a fairly cold but settled November. However, by the time meteorological Winter opened, the troposphere began to react to the stratosphere and we had a mild December. January 2017 almost had a SSW but it just never materialised. Just a bit of fun recent history there for you. 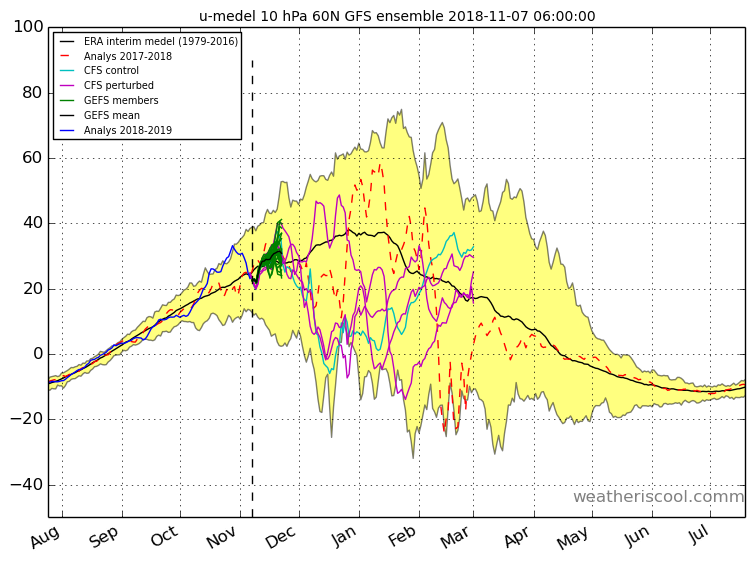 The first signs of the stratosphere and troposphere reconnecting is the first week of November of which looks pretty unsettled though models have downgraded the extent of the wet and windy weather as we've gotten closer to the time (they could go back the other way, you never know in weather world). 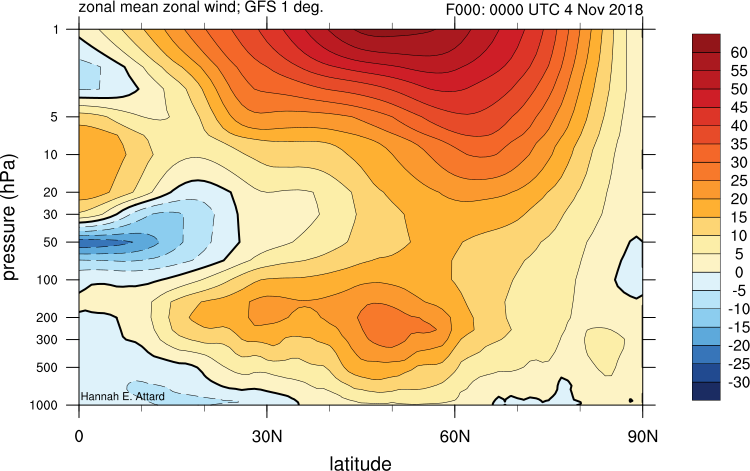 The GFS ensembles forecast the zonal winds at 10hPa to weaken through the first half of November (see the green lines). The black line is the 1979-2016 averages of the zonal winds at 10hPa. This is a significant drop from where we are now but not far from average. The other lines (apart from the red dash line which is 2017-18; notice the big plunges in February 2018 associated with the SSW event) are of the CFS ensembles. They continue to forecast weak to very weak zonal winds through the second half of November into December. Sunday's run even showed 3/4 going for some kind of stratospheric warming but today's run has gone back to weak/very weak zonal winds rather than reversed. 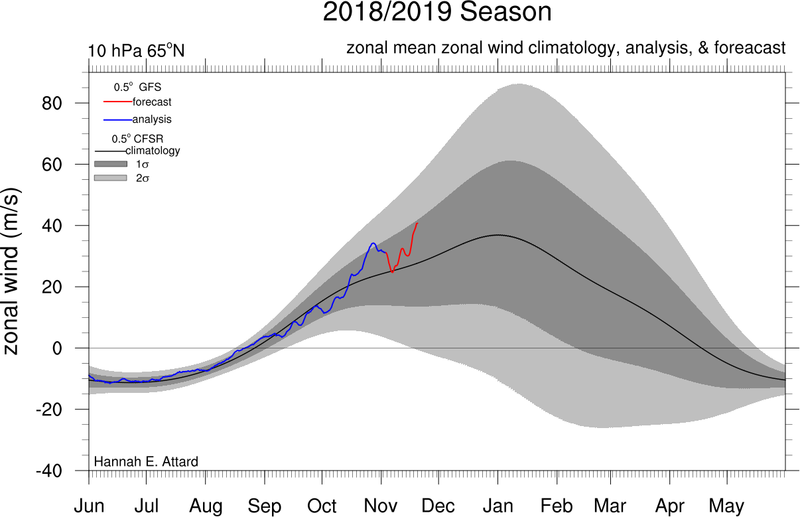 Just gives away their poor reliability but it's interesting how often they've picked up on these weak zonal winds or a stratospheric warming to occur in the final two months of 2018. The previous two ECM runs have been showing an Aleutian Low and a big ridge of high pressure to the northeast of Europe at +240 hrs. These are two things that can be precursors to stratospheric warming events. The ECM clusters are in full agreement on the block of high pressure to build to the northeast of Europe and dominate here during the first to second week of November 2018. According to Eric Webb, we are in the most favourable part of the QBO cycle for a major SSW to occur. Other SSW/Canadian Warming (CW) events that have occurred at this same time in the QBO cycle include January 2013, January 1985 and December 1978. If an SSW were to develop from some of the Scandi blocking showing up on the models, how long would it take to start seeing corresponding 10hpa temperature charts? So far, there's no sign of any such warming showing up in the strat, despite the consensus for a period of blocked weather throughout mainland Europe. Additionally, the ECM shows the block disintegrating at 240h, even though the GFS does not. 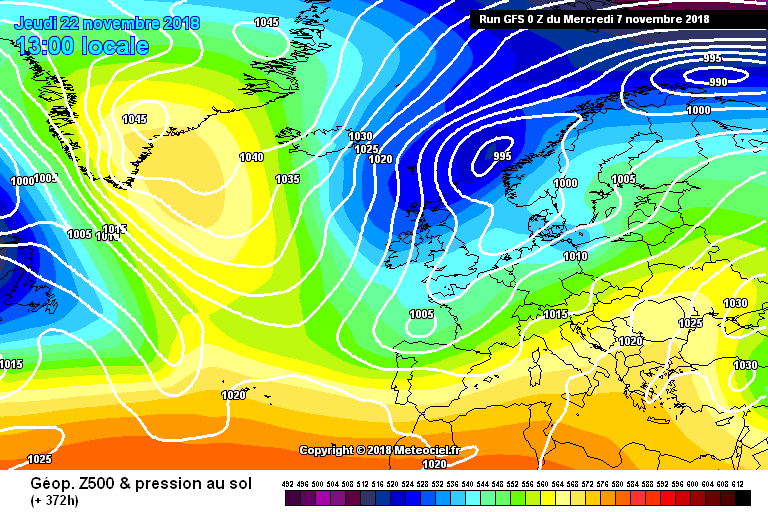 Looks like we'll have an interesting start to the Winter, from a chart-watching standpoint at the very least! A couple of weeks just like it takes for a tropospheric response from a SSW. Warming this early on is an extremely rare event, have to go back to November 1968 for the last full blown November SSW whilst the last November Canadian Warming was 2000. A few days ago, models including the ECM and GFS were pointing towards a bit of warming in the stratosphere which would certainly help from the point where we are right now which is record breaking cold levels. Here are the latest stratosphere temperature analysis charts for 10hPa and 30hPa. You can still clearly see that the temperatures are well below average in the stratosphere. 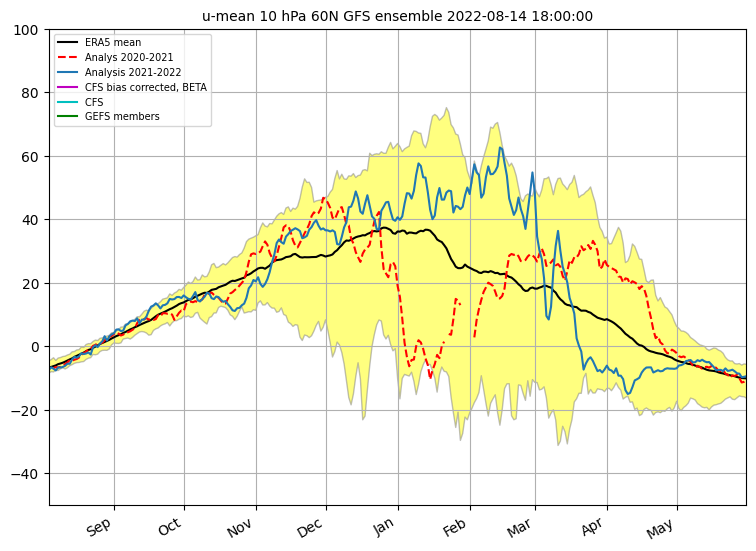 This is the latest ensemble prediction chart from the GFS and CFS ensembles. The green lines (the GFS ensembles) forecast a dip in the zonal wind speeds at 10hPa in the next week which usually would correlate with a slight risk of weak blocking around the North Pole - this is what is indeed happening. However, after this dip, they forecast the zonal wind speeds to go back to average with a good few of them even going back above average. This would be associated with a stronger westerly flow and the chance of some late Autumn windstorms if it were to verify. Meanwhile, the CFS ensembles continue to reflect weak zonal wind speeds through the early Winter and in this particular run of them, two ensembles take the zonal winds to reversed levels at the start of December. This would be a SSW event. Most ensembles continue the same theme through January before February shows a recovery especially with one particular ensemble member which goes to very strong zonal wind speeds. Obviously still all speculation and little to no reliability but it's always interesting to see nonetheless. Why are we seeing this slight drop in the zonal winds? At 1hPa, there is a warming taking place which is at the very top end of the stratosphere. You can see this on the cross-section. To get a SSW, you'd want to see these warm temperature anomalies filter down into lower levels of the strat including 10hPa and 30hPa. This will not happen this time and we'll see a recovery in the Polar Vortex regaining strength (as shown from the above diagram and another below). So, all in all, quite a healthy Polar Vortex for now with westerly patterns likely to dominate for the foreseeable future. The stratosphere is coupling up with the troposphere after a recent disconnection. Last edited by sryanbruen; 04-11-2018 at 16:27. Latest stratosphere analysis charts from the JMA show that temperatures have risen somewhat in the past three days at 10hPa and 30hPa. 30hPa temperatures have gone back to average whilst 10hPa temperatures remain on the cold side. With the forecasted healthy Polar Vortex, expect these temperature charts to drop back down again. Latest GFS does not hold any promise on the Polar Vortex changing any time soon with cooling taking place then flat lining. GFS ensembles agree with the operational run too as shown by the diagrams below. It's not all negatives for cold lovers though as it's better to have the Polar Vortex locked in undisturbed over the North Pole through this period as it's a cooling time of year. As it's locked in, the cold can get deeper and deeper. When northern blocking does form sometime in Winter or Spring then, the cold can be more extreme than say if you were to have the northern blocking beginning in Autumn. 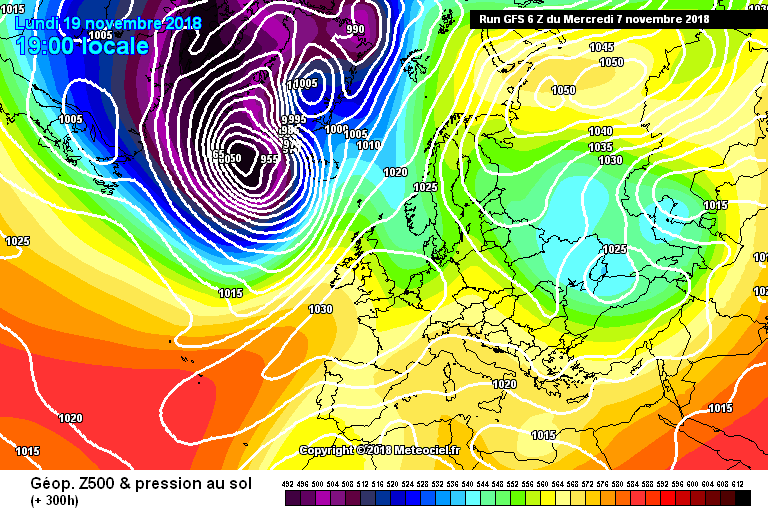 Some interesting charts from GFS runs today mind you in Fantasy Island*. The 0z showed a Greenland High and a northerly flow forming bringing down 850hPa temperatures between -5 to -10c on November 22nd/23rd. The 06z showed a very stubborn area of high pressure near Russia and Scandinavia of up to 1050mb. Not affecting us on the run as we're under high pressure also but it could have been the start of nature's teasers for what was to come if it were to verify. *Note: Fantasy Island so will change in next runs of the model and is shown just for fun. Last edited by sryanbruen; 08-11-2018 at 20:05. Getting very interesting with the troposphere set to affect the stratosphere as the two continue to disconnect. This ECM looks like the Polar Vortex is likely to split into two. Lots of interest still to be found in the lower stratosphere. Just goes down and down and down.